Mission San Jose was founded June 11, 1797, by Father Fermin de Lasuen and was number 14 of 21 California missions. It was named “La Mision del Gloriosisimo Patriarch San Jose”, in honor of St. Joseph.10 The next closest mission geographically was Mission Santa Clara, built in 1777. During a recent tour of the Mission, we learned that Jose Maria Amador’s father supervised the building of the original Mission. Later you will see the large role Jose Amador played in the development of the San Ramon Valley. The site had many natural resources. Under dedicated padres’ direction, Mission San Jose thrived. It became the most resourceful, prosperous and successful Mission in Northern California. It maintained vast herds of cattle, horses, mules and sheep, and it furnished much of the food for other Missions as well as government entities. Many foreigners came to visit and trade for Mission products, and it became a stopover for many settlers after their treacherous trek over the Sierra Nevada Mountains. The adobe museum building is a surviving remnant of the huge original rectangular of living quarters, shops and storerooms. 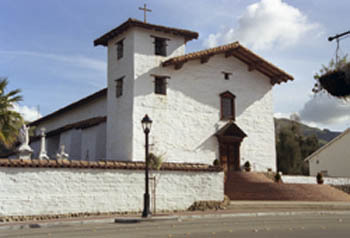 In 1984, a replica of the 1809 adobe church was completed; the original was destroyed by an earthquake in 1868. 3, 9 St. Joseph church replaced the Mission church in 1868. It remained in place until the Mission was restored and the adobe replica of the original church was built. When St. Joseph Church was moved, the long lost grave site of Robert Livermore another prominent local name was found. If you visit Mission San Jose church, the grave stone is still the floor. The city of Fremont was formed by the merger of five small communities – Centerville, Niles, Irvington, Mission San Jose, and Warm Springs. Now, only one half of one percent of the population living in Fremont is Native American. In 1800 of course most of the local residents were Ohlone Indians. When you visit, or drive by Mission San Jose, it is a reminder of our Spanish heritage and a memorial to the thousands of Native Americans who lived, worked, and died there. The Mission was the home of the first Alameda County Christian church, and school; industry, farming, and cattle raising began around the Mission also. In 1826, Amador and his wife Dolores Pacheco moved to their granted land area. Shops were built by the Native Americans to produce cloth, shoes, soap, saddles, furniture, farm tools, and harnesses. His vineyard held 1500 vines and 50 trees in the orchard (1832). In 1837, Amador and Robert Livermore planted crops in what is now known as Sunol. Soon after the Gold Rush, in 1848, Amador went to the mountains (now Amador County) and brought back 114 pounds of gold within a period of two weeks (near what is now known as the city of Amador). As Gold Rush settlers moved into this area and squatted on Amador’s land, he began to sell off his land in the San Ramon Valley. 9 The Leo Norris family made the first legal purchase with clear title to a league of land (the NW corner) from Jose Maria Amador in 1851.2, 7 Amador began to sell his land in 1852 to Samuel Russell, Jeremiah Fallon, Michael Murray, James Witt Dougherty (10,000 acres), and William Glaskins. Amador sold his parcels at a low price and thus became in debt. Penniless, he lived with a daughter in Watsonville until his death in 1883 -- in poverty -- at the age of 89. He was buried in Gilroy. Ninety-three years later in 1976, the simple wooden cross on his grave was substituted with a granite headstone. Amador’s fascinating memories were captured by Hubert H. Bancroft and stored at UC Berkeley in 1877.9 These memoirs were taken by Thomas Savage and translated into English by Gregorio Mora-Torres in California Voices: The oral memoirs of Jose Maria Amador and Lorenzo Asisara. In the Shadow of the Mountain, Highlights from the Museum of the San Ramon Valley, by Beverly Lane, 2000. Corridor Country, Vol. I, Stuart. Historical Persons and Places in the San Ramon Valley by Virgie V. Jones, 1977. Dublin Reflections, Virginia Smith Bennett, 1978, 1991. Amador’s Recollections, The Bancroft Library, 1877. Historic Mission San Jose website, 2009.